The .38 Special or more formally named, Smith and Wesson .38 Special is still one of the most widely used revolver cartridges in the world, even today. 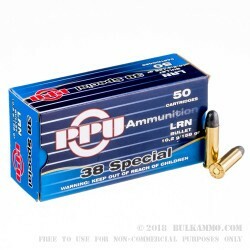 Also known as the S&W 38 Special, .38 SPL, .38 Special, and .38, the .38 SPC is a cartridge that was designed to replace the older, anemic 38 Long Colt loading. It was designed by Smith and Wesson here in the United States of America for our military. 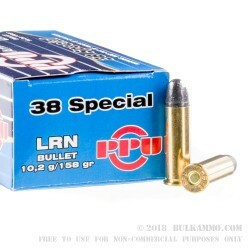 These PPU .38 Special 158 grain LRN or Lead Round Nose bullets feature reloadable, straight walled, rimmed, non-corrosive Boxer primed brass cases. They are loaded into boxes of 50 rounds, with 10 boxes total in each 500-round case. 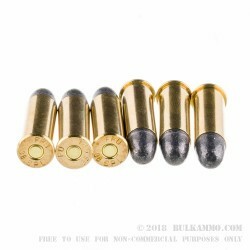 These 500 round bulk cases are a great way to take out your friends and family to train them on how to use your revolver. Get yourself a case or 2 now! Originally founded over 90 years ago, Serbian ammunition manufacturer PPU or Prvi Partizan has been producing some of the most popular Com-Bloc cartridges on the market since 1928. Prvi Partizan provides quality ammo at affordable prices and is well known for making some of the rare calibers out there. They produce the 7.92x33 Kurz, the 8mm Lebel round, 8x56mmR, and other rare loadings, according to their website. 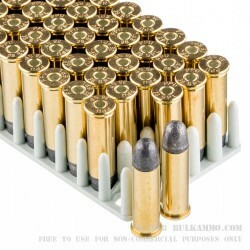 They offer military and civilian ammunition in a wide array of calibers and bullet types. Check out our other PPU ammunition selections for more info.